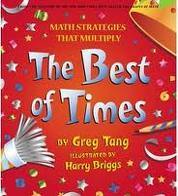 This book is so much fun to read because it helps you learn how to multiply with rhyming words. You also learn some tricks that allow you to multiply even faster. This book has great illustrations and a different animal for each times table. Plus, it gives you problems to try on your own! Do you know your multiplication facts?